1-Decisions regarding the relationships among the various parties. i.e. various project delivery systems that form the basis for the project’s contractual relationships and dictate the span and duration of responsibility of each party. 2-Basis upon which the contractor will be paid. We identify different types of contracts that are used to measure how the construction contractor will be paid for completed construction work. 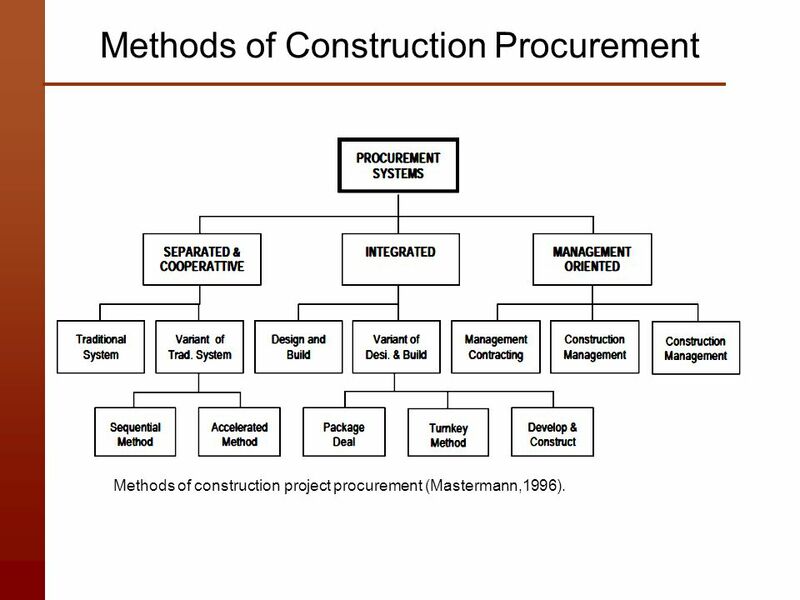 What is construction management procurement method? Management procurement is a method where construction work is completed using a series of separate works or trade contracts which the main contractor is responsible for managing. The contractor does not actually do the physical work but is paid a sum for managing the project through the various works packages. The employer starts by appointing consultants and a contract administrator to prepare drawings, a project specification, and cost plan. The employer has control over design throughout the project through their professional team. The contractor is appointed by negotiation or tender, and interview. The works packages are usually let by competitive tender. It is beneficial for the proposed contractor to be involved as early as possible as they will provide expertise in terms of buildability and programming of the works packages.